So here we are with a tactical post – a genuine one again after all this time! Today I’m going to do a review of the Assassins codex that was released on Saturday. I’m not going to cover the background parts of the release, save to say that the Officio Assassinorum gets a decent enough going over in terms of fluff. First up, assassins all have the same profile – and they all cost in the region of a full tactical squad of space marines without upgrades. They’re twice as good at shooting and fighting as marines, and are just as strong and tough. 3 wounds, initiative 7 and 4 attacks basic plus the best leadership there is means even without any other benefits, these guys are right up there with the best profiles in the game, especially with the lengthy list of special rules each has. They also come with a stock of special rules common to each of the four types – they’re all fearless, can infiltrate, can’t be joined by other characters, come with a stock 4++ and don’t suffer the initiative penalty for charging through terrain, they also roll an extra die for moving through terrain and deduct 2 from your opponents look out sir rolls. A big batch of nearly-finished! Hi all - I've been really bitten by the painting big again this week, spurred on by a nomination amongst a group of my friends to finish three sternguard models by Saturday. 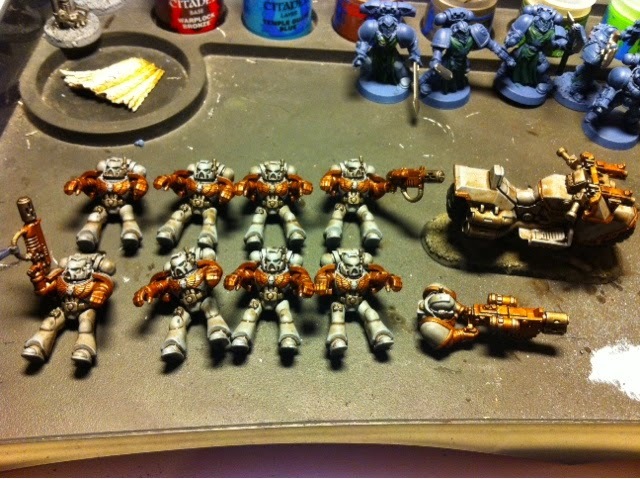 Of course that left me with a dilemma - I now have three finished sternguard and seven unpainted for the unit. In came two more models to my painting list to make up a min sized unit. 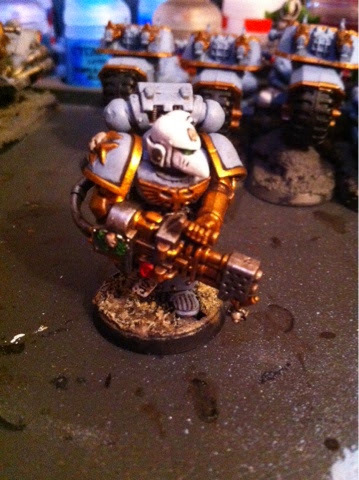 I've also found myself recently cursing the fact that one of my painted tactical squads incorporates a flamer and a multi melta - instead of the melta and multi melta I'd planned for. 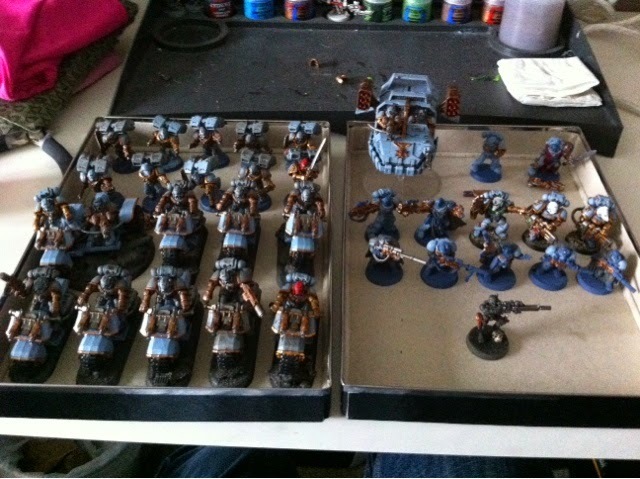 This was to allow me to use them in a 500pt game, but has left me since then with 1 unpainted model in the unit. So in came that guy. 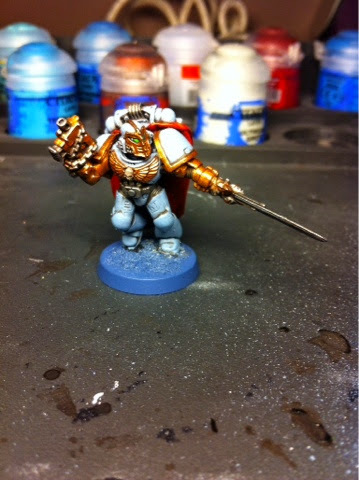 I love painting characters, and though my chapter master isn't quite finished I keep looking at my terminator captain model lying there unfinished, so I added him to the pile - and just to finish off I decided to reward my scouts, who won me my game on Thursday incidentally, with a paint job. Added to the part finished assault squad and bike squad that left me with a pretty pile of painting, and reading the assassins codex on Saturday made me add my vindicare to that as well. So here we go, this is the painting pile at the moment - this must all be done before I start anything else! So over the last three days I've been beavering away, and all of those models are now up to the same stage, with the agrax earthshade wash layer applied. Yes, there are Necrons in there too, but the wash is their first layer so I figured I'd apply it whilst the pot was open. Look out for more finished models in the near future then! 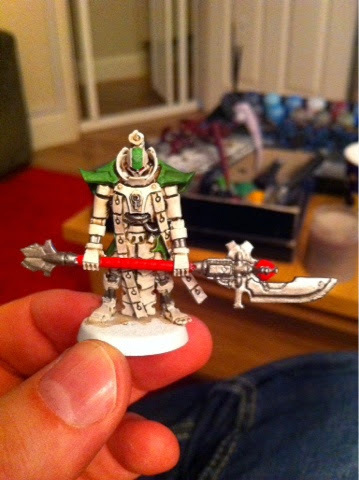 Ok I'll admit it, there have been a few false starts with my Necron collection, including two discarded colour schemes and several lists to be re-written. Today therefore I'm going to talk you through my thinking about the latest incarnation of Phaeron Sobekhotep's legions. Following the changes from 6th to 7th I pretty much tore up and threw away my last list - in particular the changes to scoring and vehicle damage made it redundant. So what do I want from my list then, what are key ingredients to winning games? Well first you need resilience (or a lot of bodies) to weather your opponents fire, second you need mobility, as there is no longer a guarantee of objectives in your deployment zone, and third, you need either withering firepower or real combat punch, to clear other units off objectives. Necrons themselves are the very epitome of resilient, their re animation protocols being a pseudo feel no pain, and with immortals as troops, T5 makes that even tougher. Night scythes also bring mobility other factions can only dream of, though I'd avoid using too many as they come across as being the choice of the beards gamer. 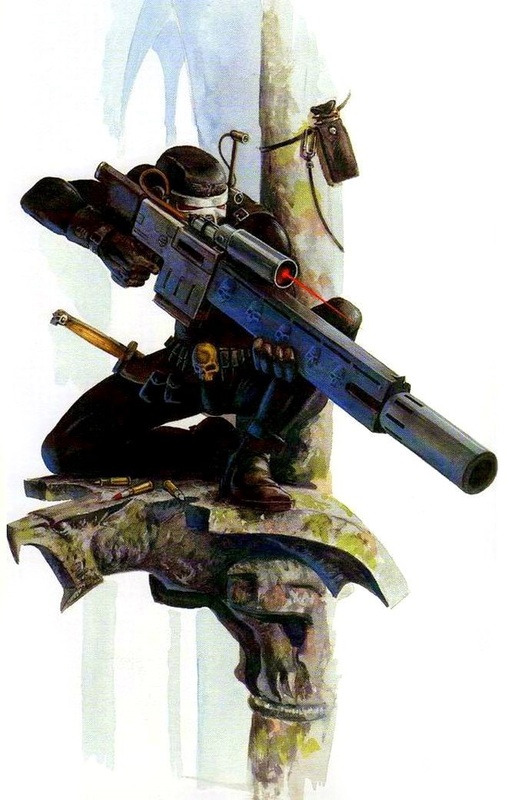 Finally firepower - not something Necrons are short of, the main limitations to their guns being quite short range and limited access to genuine anti tank (I don't rate S10 weapons as anti tank, penetrating hits are too rare against AV13 and 14, with no guarantee of significant damage. So what choices did I make and how did I go about putting the list together? I almost never use special characters, so my choices here were limited to the overlord or destroyer lord. 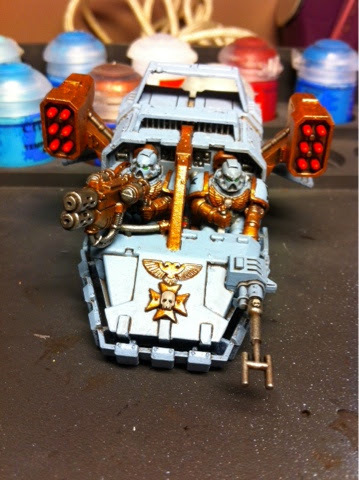 Anyone who's read the chariot rules in 7th edition though knows well that they are seriously tough, and with the owner being able to allocate shooting hits, you can make sure than melta weapons etc aren't going to cause you too much of a problem. As someone who's used reaver jetbikes bladevane attacks, the sweep attacks are awesome, especially when you consider that the warscythe makes the warlord S7 and AP1, and can then charge in the following assault phase too. I'm a big believer in tough troops, particularly now they can secure objectives in preference to other units from the force org, it's a win win really, either your opponent focuses on getting rid of them, in which case your own support units are free to cause havoc, or they ignore them, in which case they can win you the game. I wanted a manoeuvrable unit here, so took a ten strong squad of immortals with gauss blasters in a night scythe - these guys bring serious firepower and are tough to put down. 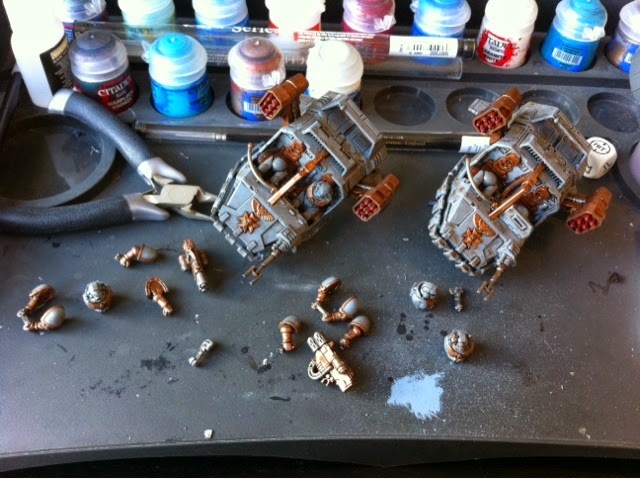 Backing that up I also took two smaller units of six immortals with tesla carbines, they would generally stay out of harms way and head surreptitiously for objectives. 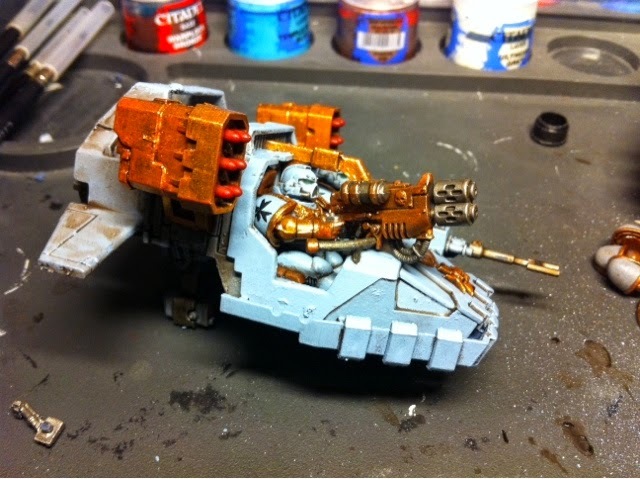 Boosting my all round firepower I took a Triarch stalker - it's the only model in the whole codex with a melta weapon and it's boost to shooting for my other units could prove a game changer. I needed something to deal with hordes though, so looked into the heavy support section and picked up a pair of annihilation barges. I have these the gauss support weapon option as it's AP3, and the loss of potential extra shots are more than compensated for against power armour armies! 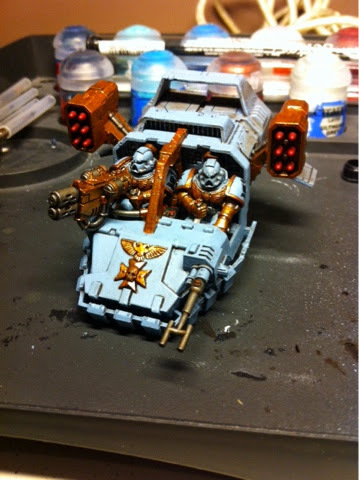 I still had a few points to play with though, and with only one dedicated anti tank gun in the army I needed something else - that was when i reread the rules for warscythes, and the S7 attacks with armourbane from a Lychguard unit were too good to miss. They should take down most tanks for me, so to make sure they had the chance I put them in a night scythe. Finally then I picked a unit of deathmarks - I know I've previously stated I couldn't really see a use for them, but with the Triarch stalker around they could potentially put a lot of wounds onto a unit, and having been hurt by eldar bladestorm last game, I understand that rending shots can be huge! 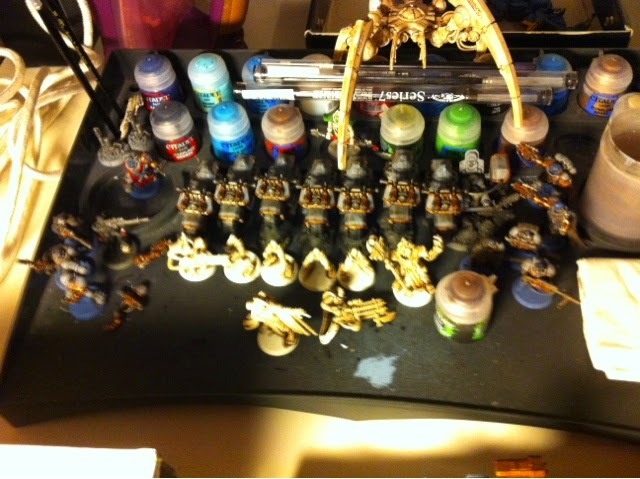 So there you have it, 1500 points of undead goodness, with all the bases covered. Till next time! Even the dead should be pretty! Hi all, welcome to my weekly painting update - though I had a busy week last week so didn't manage as much progress as I'd have liked. When I left you on Monday I had been working hard on a land speeder in order to get it finished for a) a game I played on Thursday, and b) a challenge I'd been set by friends. Well I'm pleased to say it was finished in time, and the other speeder was close enough to completion I didn't have to proxy it! Due to social commitments however I didn't get to do any more painting until last night. There's been a lot of talk recently about the remaining 40k codices still to move to hardback, and sadly it looks like I've got three of the four - blood angels, Necrons and dark eldar! Still, it'll give me plenty of inspiration at the end of the year to paint other parts of my collection, so I need to make sure my marines are as complete as possible by the time those codices drop. In the meantime however, I've been trying to figure out what to do with my Necrons, despite initially being happy with the red scheme I'd completed on the stalker, I've gone off it in the intervening period, so I needed something different. After much pondering, I settled on a very pale scheme, mimicking the pre-heresy death guard colours to some extent using pallid wych flesh and a combination of washes. Here's the first test mini and I think it's worked really well, I can definitely see me with an entire army painted this way. I still need to tweak the red, which is way too bright at present, but this is a good start in my mind. Added to that then, I made a concerted effort to get some visible progress in on my second iron fists bike squad. Now I don't often say this, but I think painting bikes is my least favourite part of this army - probably not good news that I'm picking up three more scout bikes from a friend next time I see him then eh? Still, here are the riders of the second squad, ready for highlights and details. I've also made the tiniest amount of progress on my honour guard squad (I've painted all the blades in their base silver) and started top coating the assault squad - keep an eye open for pics next week along with more progress with the bikes I hope! Tomorrow's tactics article will be a re-written list for the Sobekhotep Dynasty. Refining a list based on performance. Morning all, hope you're all well and in fine fettle, today I want to talk about the process of refining, or evolving, an army list. I love writing army lists, which I can honestly say wasn't always the case. Previously, in my non-playing days, I would write out a basic list with a nice wide spread of units and work to that one list, which usually ended up around 4000 points. As you can imagine, that didn't work so well for winning games, so I began writing lists to specific points levels. Once I started winning games, I then began to want to play with different things, so I started writing lists around a theme. 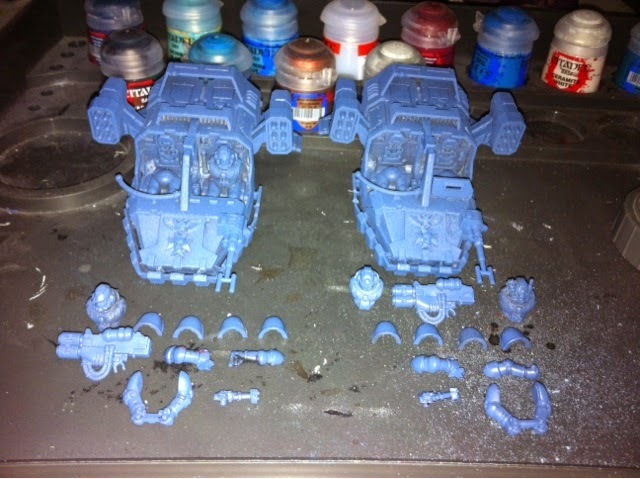 Some work better than others of course, and my 'default' selection I've discussed on this blog before, but it mainly consists of two bike squads, a tactical squad and centurions backed up by other elements. Recently though I've noticed a major trend in my games with that list, which is that the tactical squad and their librarian support don't get into the game much. I think there are two main reasons for this - first is due to the different way 7th edition manages objectives. Because objectives are now placed before table halves or deployment type are determined, the tendency at my club has been for players to place objectives more in the centre of the table rather than in deployment zones, meaning units can't just camp on them from the start and being mobile is much more important. Added to this, the ability for any unit to now hold an objective means that if there are objectives in the deployment zone, there are better options than the medium range tactical squad to hold them. The second reason is one of my own army composition, specifically that because I mainly use bikes and fast moving units (or drop pods), the majority of games result in the fight being much further up the table than if I had a more static force, with the tactical squad and librarian therefore being out of effective range much of the time. With that in mind therefore I decided to make a change to my list, by replacing the tactical squad. That left me with another issue, of havin a footslogging librarian and only the centurions for him to join. That was never an option, as I'd be leaving way too many points out of reach on the table with little to do except buff the centurions with blessings. What to replace them with though? The tac squad had a plasma gun and plasma cannon, so I was taking out some AP2 shooting against elite infantry and light vehicles that I'd need to replace somehow. Requirement number 1 though was that whatever I took would need to be able to keep up with the fight. I'll be honest, I thought about more bikes, but I really think two full squads is enough for now (I may revisit this later...). 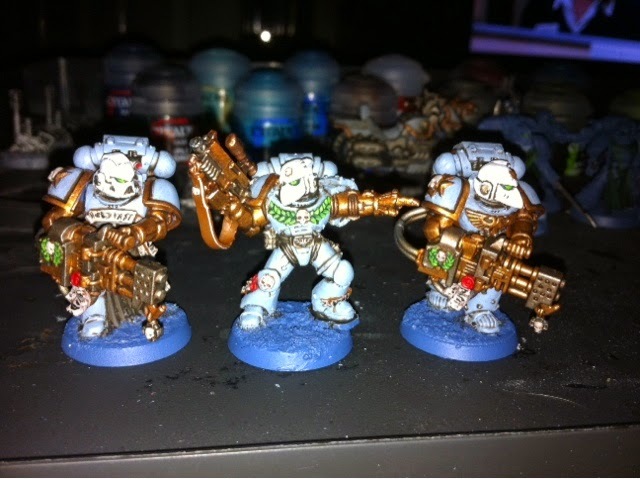 In the end, after ruling out assault marines, another flyer etc, I re-read the codex for inspiration. My eyes settled on the landspeeder entry, knowing I had two unpainted in my garage, and I noticed something I hadn't registered before now - not only are they fast skimmers, allowing them to shoot two weapons even when moving 12", but they have the deep strike rule, meaning that equipping them with multi meltas could give me great tank busting capability, as my bike meltas often struggle to survive long enough to get within half range. I had the seeds of an idea, multi meltas would give me a replacement for the plasma weaponry I'd lost, and for a secondary weapon the typhoon missile launcher would back that up with another 4 S8 missile shots, ideal for mass stripping of hull points. Two landspeeders equipped like this used up all the points from the tactical squad, so I had the Libby's cost to play with. My only concern about deep striking the speeders was the potential inaccuracy might leave them out of half range for their alpha strike. 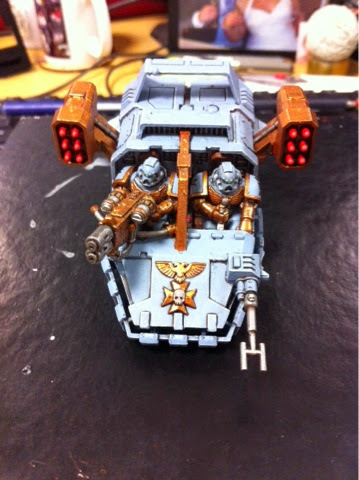 The missiles would make up for this against light vehicles but for the heavier stuff I'd need that extra die. Step in some way of locking their deep strike on target then, and though the skyshield pad does this perfectly, it's easy to avoid. A locator beacon on the drop pod would also achieve this objective, but again can be evaded. Finally I settled on a good, and very satisfyingly fluffy, choice - scout bikers. 4 of them with grenade launchers and a locator beacon could deploy after the enemy, secure accurate landing for the drop pod and still provide the same service to the land speeders. Even better that they fit so well with my army theme! In conclusion therefore, I think it's important when you use a 'standard' list for your games that you constantly evaluate the performance of the units within it - don't judge any unit on just one game, but don't be afraid to change a winning list if some units are consistently not affecting the game. When you do decide to change a list, try to work out why some units aren't performing as you'd expect and make the changes to take account of those reasons. Oh yes, and if your changes don't work, apply the same logic - my landspeeders might miss with all their shots and get totalled the next turn, but I'll give them a few games grace to see how they perform over time against a variety if opponents before deciding to keep them in or cut them out. Hello there fans and followers, the eye is back, and it's burning bright once more! Well after a relaxing and refreshing holiday in the Balearics, I spent some well deserved time with the family before diving back into hobby goodness. 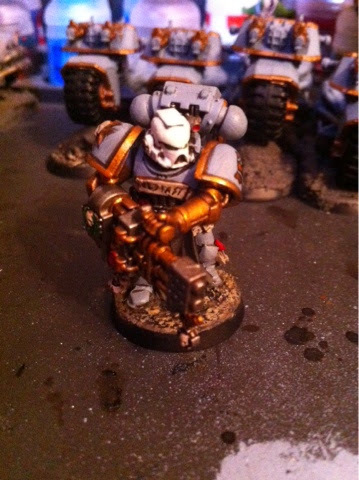 In terms of painting, when I left you I was in the middle of terminators, the second bike squad and a unit of assault marines. Since then, I've...made absolutely no progress on those models whatsoever. Without further ado then, here are the various stages of painting that the Iron Fists vehicles go through - I may expand on this at some later stage and do a full breakdown, but for now it's just pics. First layer stage, where I've applied the basic blue, gold and silver. The models have now been washed all over to dirty down the crevices. First layer stage post-wash where the blue and a lighter gold are applied. 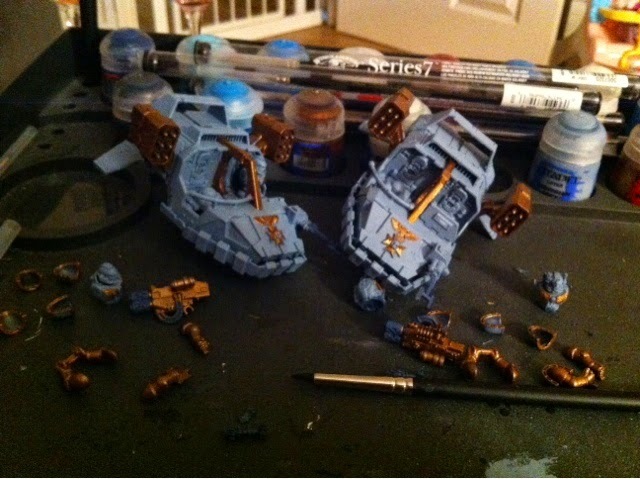 Almost finished, the details are all highlighted, I've just got the main armour edge highlights to do. 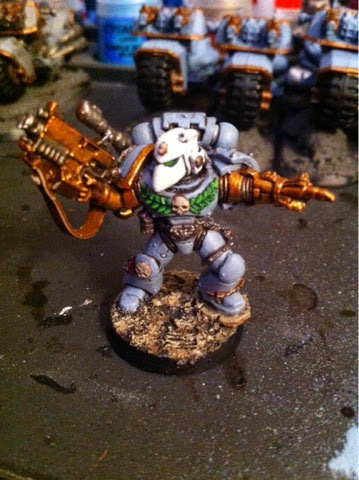 I've also got the majority of work done on this guy, who is going to be used as Chapter Master Sagat when he shows up for work in Artificer Armour and not Terminator Armour.